Saprotrophs are living organisms like fungi and bacteria that grow and feed on dead plants or animals. 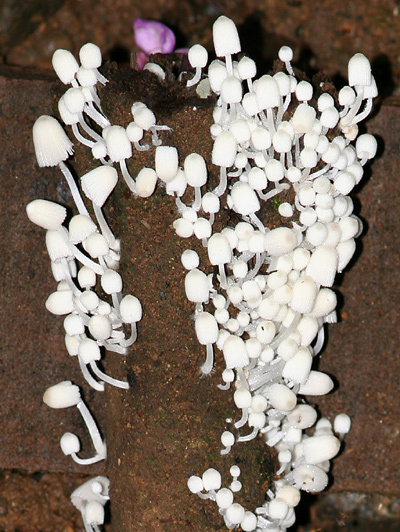 These ghostly white mushrooms were growing on a wooden retaining wall lining a jungle path in Costa Rica. 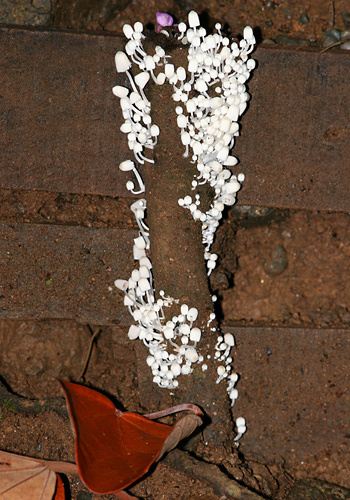 These fungi were so brilliant a white that they almost seemed to glow in the gloom of the dense jungle. Unpreserved wood does not last long in the jungle, and what is not quickly devoured by insects like termites is soon consumed by wet rot and fungi like these delicate mushrooms. Unlike plants, saprotrophs do not produce green chlorophyll or photosynthesize, but instead they get all of their energy from the decaying tissues that they grow on. Because of the lack of chlorophyll, these organisms can either be colorless or come in a variety of strange and sometimes lovely colors. Saprotrophs used to be known as saprophytes, but "-phyte" refers to a plant and nether fungi nor bacteria are plants, so saprotrophs or saprobes are the terms now used to describe these organisms.